French energy giant Total's Elgin rig, 150 miles (240 kms) from Aberdeen in eastern Scotland, in the North Sea. Total said Monday it had successfully plugged a gas leak at the platform that cost the firm hundreds of millions of dollars and threatened to trigger a major explosion. French energy giant Total said Monday it had successfully plugged a gas leak at a North Sea platform that cost the firm hundreds of millions of dollars and threatened to trigger a major explosion. 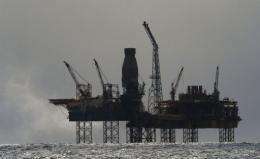 The Elgin platform, 240 kilometres (150 miles) off Aberdeen on Scotland's east coast, was evacuated in March after gas began leaking from the seabed and formed a huge inflammable cloud around the well head. The company pumped heavy mud into the stricken G4 well for 12 hours on May 15 in a bid to plug the leak. "Following five days of close monitoring, Total is now able to confirm the success of the intervention," the company said in a statement from its Paris headquarters. "Several inspection visits to the wellhead platform have confirmed that the leak has completely stopped." The firm added that engineers would now begin a weeks-long process to set cement plugs in the well, which will lead to it being permanently abandoned. Earlier this month, the firm estimated that the leak would cost it between $300 and $400 million in lost production and repair costs. "While we will obviously take on board any lessons to be learned, I want to congratulate all the teams," said Yves-Louis Darricarrere, Total's head of exploration and production. "Safely evacuating everyone from the platform and adjacent drilling rig, preventing any serious environmental impact and recovering control of the G4 well is a highly commendable effort from the teams involved."